Hollis brought a tiny bit (of what she has available) to the latest knit group meeting. A tiny slice of heaven! 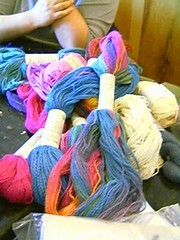 Lovely lovely skeins of happy cuddly puppy feelings similar to the warm fuzzies. Aka Alpaca. Do you see that green skein (or two)? I just looked at her and laughed. She might as well have written my name on it. She even graciously allowed me to drool on the yarn (I didn't really, in case you're afraid of buying yarn with freecia cooties). And yes, I have a few projects in mind with the new knitty patterns. Branching Out would look great in that bright summerish variegated alpaca. The website will be opening soon. Hold tight. This page is a archive of entries in the sharp points category from April 2005.
sharp points: March 2005 is the previous archive. sharp points: May 2005 is the next archive.